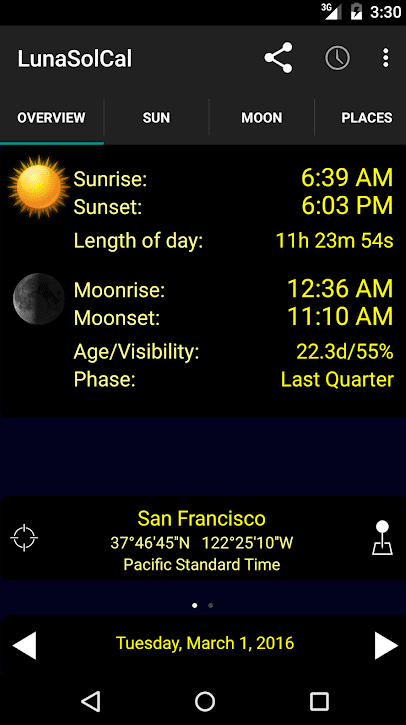 LunaSolCal Mobile is one of the most popular applications to calculate sunrise and sunset times. It shows the information in details: the time of sunrise and sunset, length of day, moonrise and moonset, age/visibility, phase. View twilight (start/end): astronomical, nautical, civil. You can find a location by GPS receiver. There are more than 30 thousand cities available. You can choose any date from 01/01/1901 to 01/31/2099. Everything is simple and understandable. The app is made in dark colors. It is available both for Android and iPhone users. You can share the data with other via Twitter or Facebook. 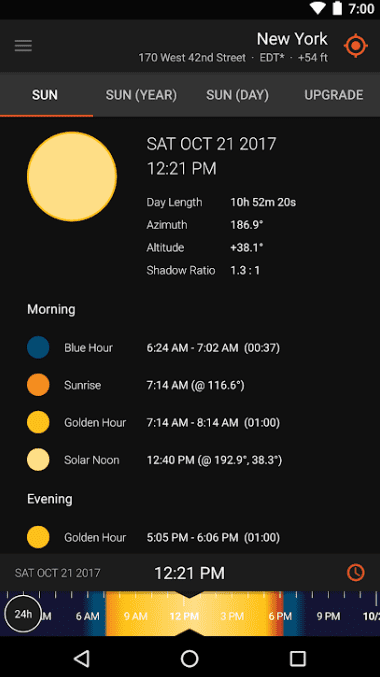 Sun Surveyor Lite was created for photographers and filmmakers to help them calculate sunrise, sunset times and plan for golden and blue hours. It also will be helpful for architects and gardeners. 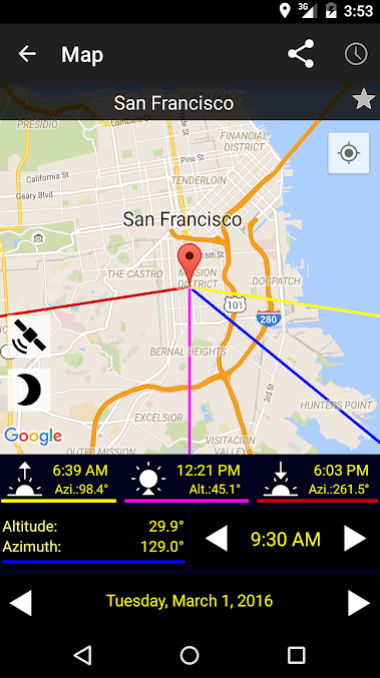 The application has a built-in 3D Compass and detailed Ephemeris. It shows twilight times: Astronomical, Nautical and Civil. The Sun Surveyor Lite application is free but has a full paid version with wider functionality: Live Camera View, Interactive Map View, Street View Panoramas and much more. 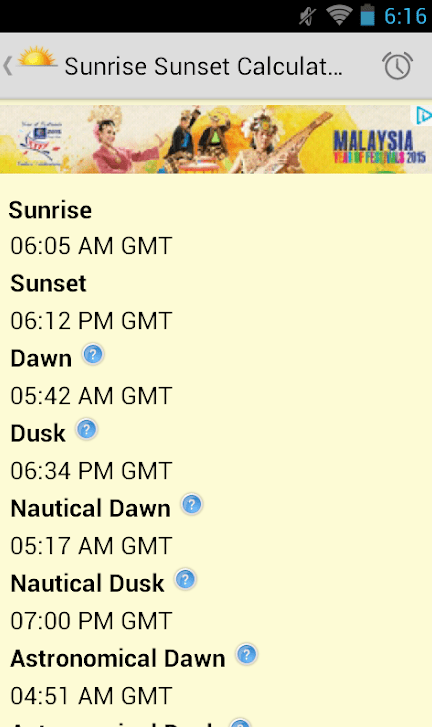 This is a simple application for iPhone users which will help you to see the sunset and sunrise times. You will never be caught in the dark again! Just install GoSunWatch on your smartphone! It shows civil, astronomical and nautical twilight visually. Sunrise Sunset Times is a free application available on the iOS operating system. It is made in an elegant style and has a clear interface. With its help, you will know about the sunrise and sunset times. You will see the accurate results according to your current location. It also counts down the length of daylight. You can view information for today or any other day chosen. In general, the app is easy to use. It is completely free. The only drawback is advertising. 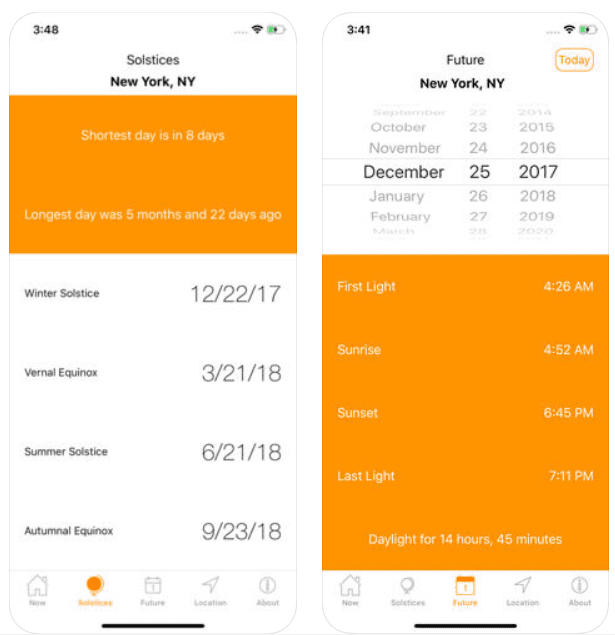 Sunrise Sunset Lite is a smart tool that helps you to view important times: sunrise and sunset, civil twilight start and end, the time of daylight. You can search for any date. Choose the city manually or use GPS. The list of cities is huge. No Internet connection is needed to use the Sunrise Sunset Lite. You can also use already saved locations. 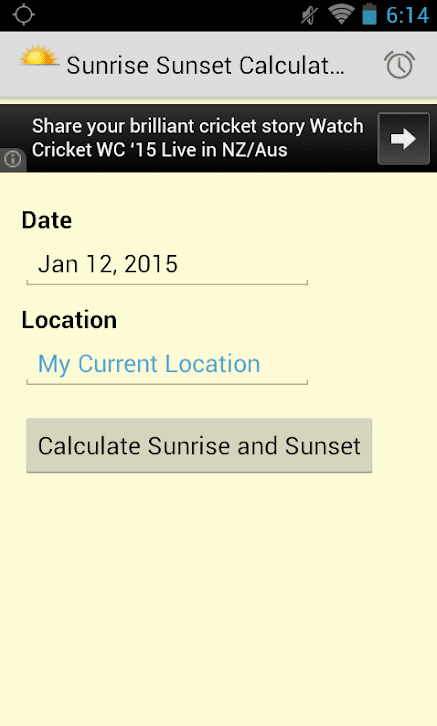 Sunrise Sunset Calculator is a simple and fast tool giving you the info you need. The app uses GPS to find your current location or you can find the city needed from the offered list. It is possible to create a Favorite List of locations. The application can work without an Internet connection. Customize widgets and you will no longer have to open the application to see sunrise and sunset times. Set all the details: show/hide seconds, AM/PM and so on. 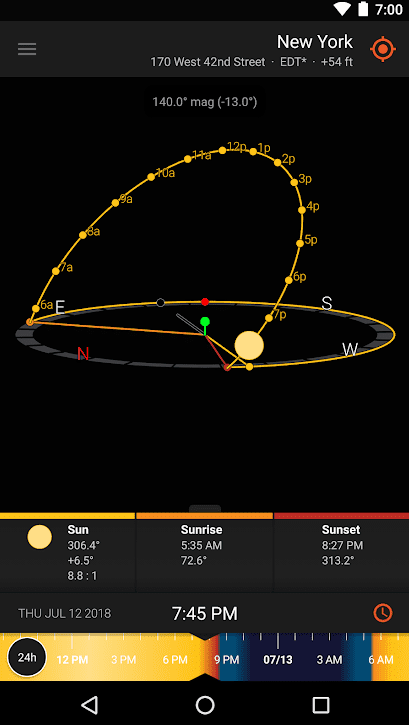 The Sunrise Sunset Calculator will be useful for fishermen, hunters, photographers, pilots. 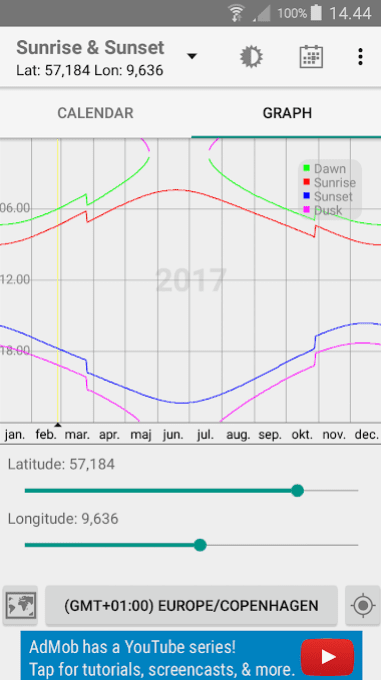 Sunrise & Sunset is a smart and unique calculator for dawn and dusk, sunrise, and sunset. One of the features of this app is the graph view what can be used for educational purpose. You can view different days and locations using sliders. By default, the local time and current location are used. You can create a Favorite List of locations for easy and fast access. The free version contains ads, however, pro edition is also available. It has a wider functionality and no ads. 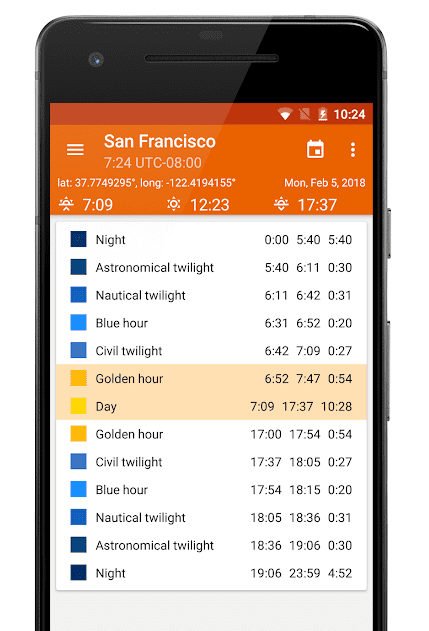 Sunrise Companion is a perfect tool when you want to know sunrise, sunset and golden hour times for your current location or any other place in the world. You can search for any date. 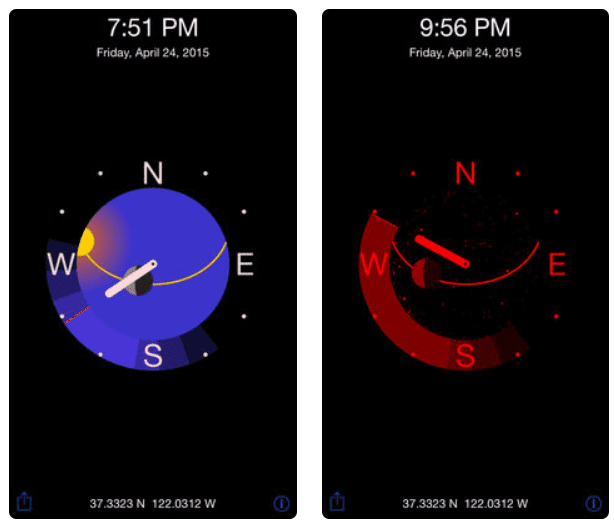 The application offers to use the home screen widget which will show sunrise and sunset times. There is a GPS function to find your location fast. Or you can search for any other location. The locations that were already used are saved in the history of recently accessed locations. You can choose a theme: dark or light. Everything is simple and minimalistic. 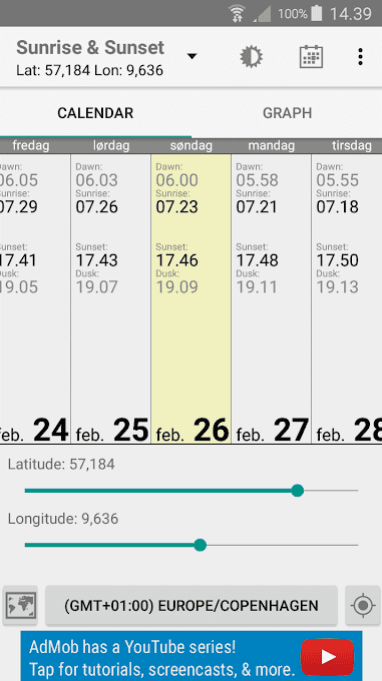 The Sunrise Sunset application helps you to know sunset and sunrise times for any point in the world for any date. You can choose a location manually or in automatic mode. Thousands of cities are available. It shows the Astronomical, Nautical, Civil and Official sunrise and sunsets. The visualization is on a high level. You will enjoy how it shows the path of the sun. 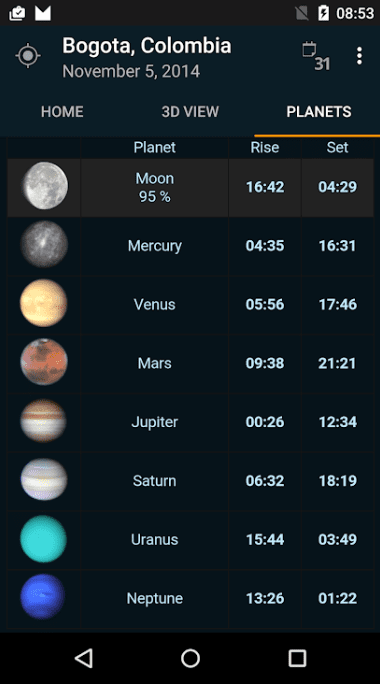 You can also track other planets rise and set times. The app can be successfully used by photographers to know about golden hours and plan photo shoots. Astronomists can use it as well for planning out Solar Observations. 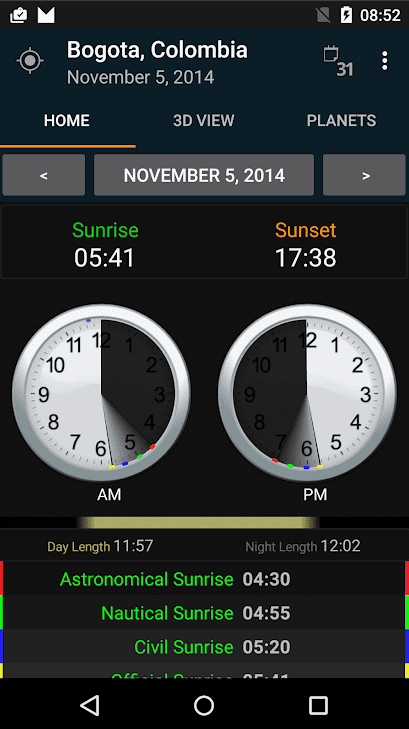 Sunrise sunset times widget is a smart digital clock and weather widget. You will get a daily forecast with accurate temperature information! 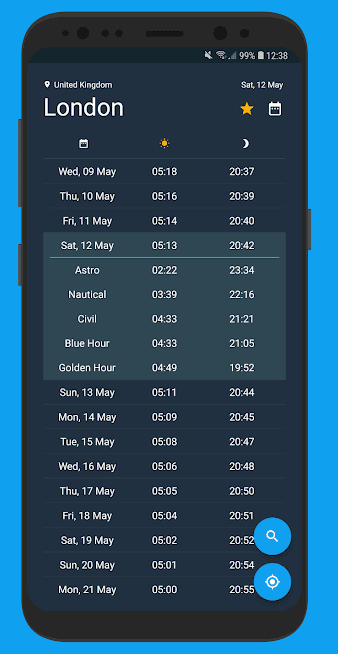 The features of the application include displaying the current temperature, date and location, daily and hourly weather forecasts, sunrise and sunset times. This is one of the best programs that determine the local weather forecast, it warns of wind and precipitation. You can easily check the current conditions on the street from the main screen. 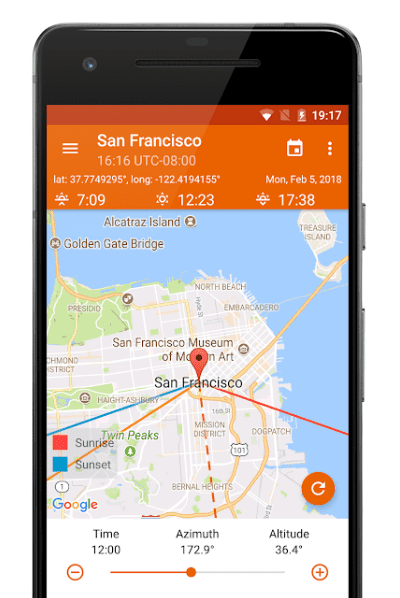 This free application will allow you to find the sunrise and sunset times for your location or any other point on the map. 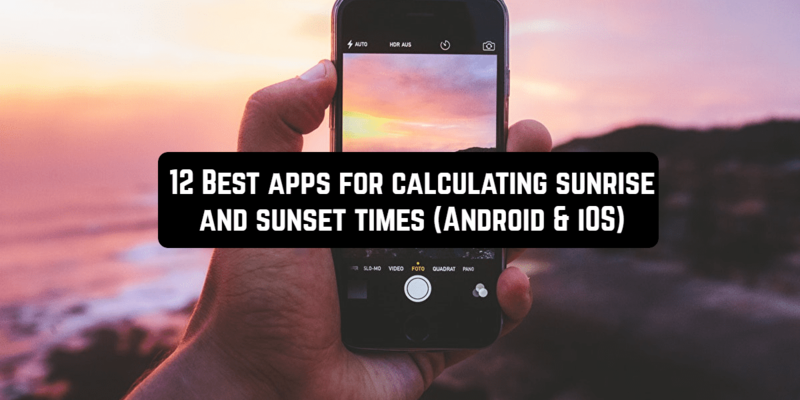 The Sunrise Sunset Calculator has a simple interface and functionality. To make the calculation you must enter Latitude and Longitude, date and location. You can choose a location from already saved ones. There is a function for customizing alarms for sunrise and sunset times. In general, the app is simple in use and performs well its function. The only drawback is some advertising during use. Surely you will agree that the best time for photography is sunset and sunrise. It is at this time that you can get the most spectacular and beautiful pictures. Find out about the time of sunrise and sunset is not difficult enough, but there is no limit to perfection. The Golden Hour application will not only show you how much the sun will rise and set, but also remind you in a convenient way. 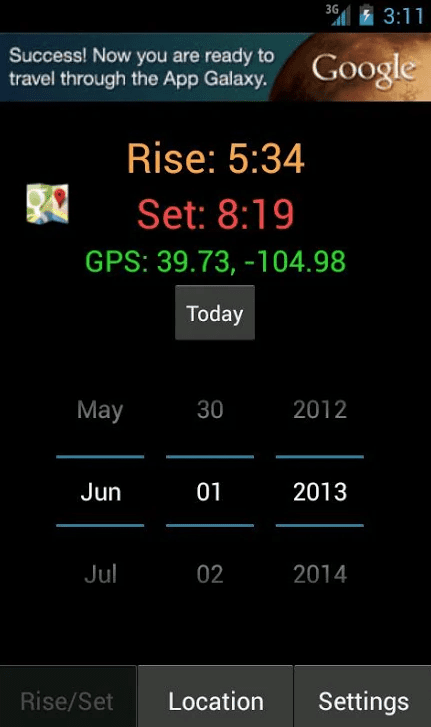 Geolocation is used to determine the time of sunrise and sunset. You can trust to automatically determine your geo position or select a location manually by searching. 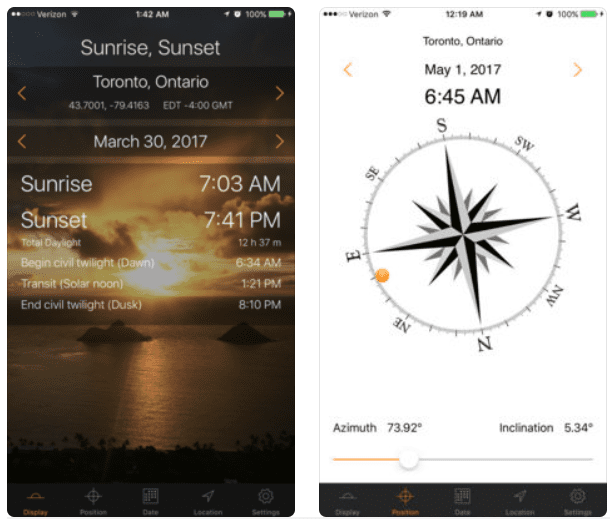 Now you can always be aware of the time of the beginning of sunrise and sunset. In order not to open the application at all, you can configure push notifications about sunrise and sunset. To do this, it is enough to enable the corresponding toggle switches in the settings. For a more “fine” setting, you can choose to have notifications only on weekdays and/or weekends. Conveniently. A fairly simple utility, but it will help mobile (and not only) photographers to simplify preparation for shooting. After all, now you will know the exact time of sunset and dawn, and to accurately forget about anything, you can use the appropriate reminders.